C Cushions has seen to every detail to ensure that our cushions will withstand the "Hostile Marine Environment". 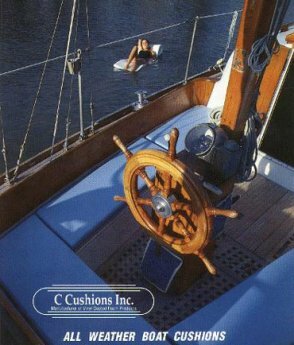 The Craftsmen at C Cushions have over 35 years of experience manufacturing Vinyl Coated Foam Products for Sailboats, Power Boats, as well as U.S. Navy Vessels. All C Cushions products are custom fabricated with great attention to detail. Dress up your boat with a set of C Cushions, for the look & comfort you deserve. With over 2000 patterns of cockpit layouts on file, chances are we have yours. 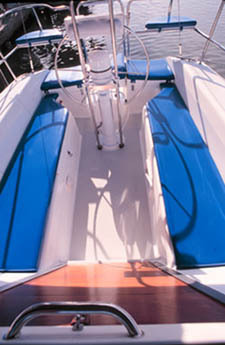 (See our extensive list of sailboat cockpit layouts, including pricing) C Cushions will produce cushions to the configuration that will fit your needs. Whether we use one of our patterns, or your custom layout, a set of C Cushions Cockpit Cushions average $42.00 per square foot.